I would like to begin by expressing my sincere condolences to the friends and family of Omid Masoumali, in particular his wife, after his tragic death on Friday 29 April, writes Fr Maurizio Pettenà, Director of the Australian Catholic Migrant and Refugee Office. It is of particular concern that, only days later a second person, a young Somali woman by the name of Hodan Yasin, set herself alight on Monday 2 May after being returned from Australia to Nauru. She is now in a critical condition in a Brisbane Hospital. This is the second occurrence of self-immolation in as many days. We have been exposed to the extreme end to which the hopelessness of detention can lead to. 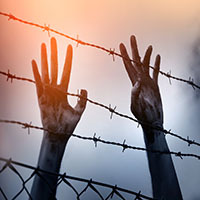 It is becoming more and more clear that the mental health of those left in limbo as a result of ongoing detention and a lack of resolution as to their immigration status is deteriorating at an alarming rate. It is my concern that the dignity of the human person is increasingly lowered among the priorities when discussing policy around refugees and asylum seekers. At a time where mental health is more and more at the forefront of the psyche of our communities, it is alarming that people placed in the ‘care’ of Australia in places of detention are left to spiral into hopelessness. Three members from UNHCR were at Nauru conducting a monitoring of the detention centre sites and were in the vicinity of Omid setting himself alight. They said in a statement that, “There is no doubt that the current policy of offshore processing and prolonged detention is immensely harmful”. They also noted that, “The situation of these people has deteriorated progressively over time, as UNHCR has witnessed firsthand over numerous visits since the opening of the centres. The consensus among medical experts is that conditions of detention and offshore processing do immense damage to physical and mental health”. As Catholics, it has always been a central tenet of our religion that when the “…dignity of the human person is violated, then all members of the Body of Christ suffer and are accordingly called to see, act and correct this evil…” (Welcoming Christ in Refugees and Forcibly Displaced Persons, 5). It is about having a consistent ethic of life. If we are to promote the dignity of the human person from conception to natural death, we must not forget those least among us who are refugees and asylum seekers. The darkness which these two people have been allowed to spiral into as a result of their situation in detention centres, goes against the promotion of a consistent ethic of life. This entry was posted in ACBC agency news and tagged detention, Migrants & Refugees on May 5, 2016 by ACBC Communications.